I have a few favorite banana bread recipes to choose from, and this is my go to for the basic, classic bread. There are only a few ingredients and I usually have them on hand. Combine the dry ingredients first. I have made this with white flour or a mixture of wheat and white flour. Then mix the butter and sugar until well combined. Add the eggs one at a time. Then add in the mashed banana, yogurt, and vanilla. 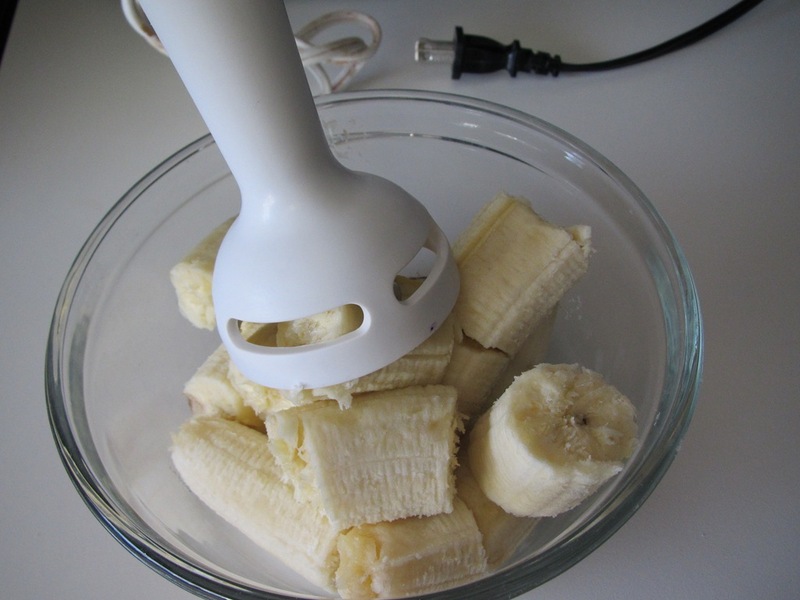 I use my hand blender to mash up my banana and it works out well. I used Greek yogurt because that is what I had in the house. 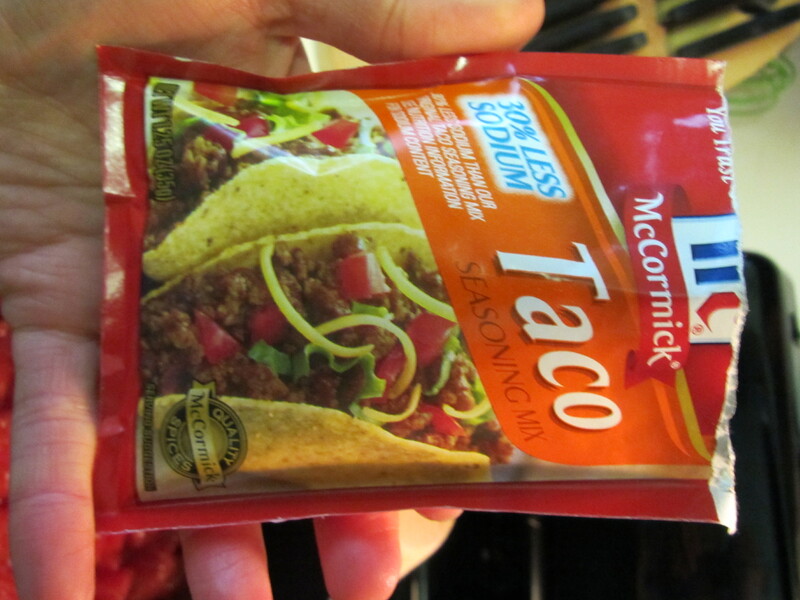 I have also used regular yogurt and sour cream, all of which work well. Add in the dry ingredients. Using the mixer can be tough with breads. I recommend stopping just before everything is mixed and finish the mixing by hand. Pour the batter into a greased bread pan and bake for 50-60 minutes. Get ready for a great smelling house. This is a beautiful bread, and it tastes amazing! A classic banana bread…the best thing to happen to rotten bananas!!! Around the holidays, I found some fabulous chocolate bark recipes in one of Martha Stewart’s magazines. I made a WIDE variety of these barks and other candy recipes for my friends and family as holiday gifts. I wasn’t blogging at the time, so I didn’t get to share them with you. So sad because they are fun and easy to make for any occasion. As I make more candy and barks throughout the year, I will make sure to post all the yummy recipes. One bark recipe that looked cute and tasted great was for Cake Batter Bark. I received the recipe from a friend, and since then I have also seen it on a few other blogs. We all tend to agree that it doesn’t taste enough like cake batter (which we all know is fabulous! ), but that it is still good. 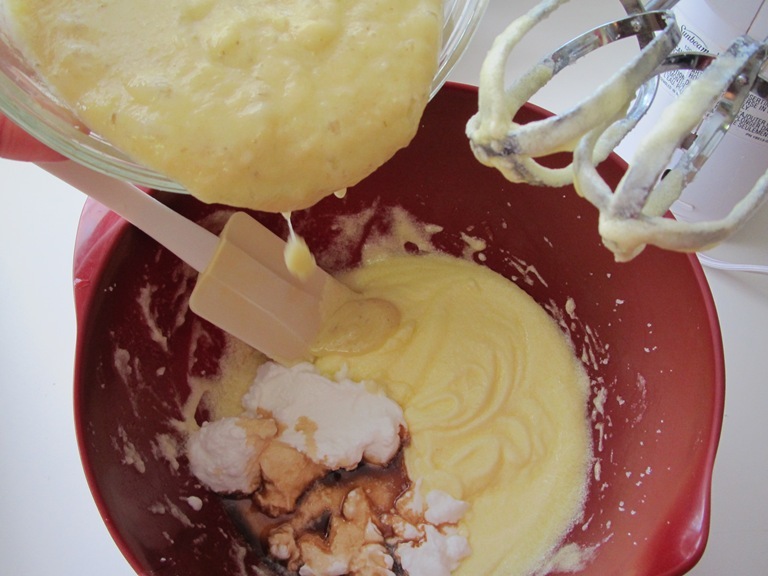 I tend to use more cake batter than is called for in the recipe. This recipe calls for high quality chocolate, such as Lindt. I didn’t have any on hand, but the Baker’s chocolate and Almond Bark seemed to work just fine. I usually microwave my chocolates. I have found that the glass Pyrex bowl is the way to go. It doesn’t get too hot and MORE IMPORTANTLY, it is easier to clean. The chocolate goes into the freezer for about 20 minutes. Then it is on to the white chocolate and of course the cake batter. Pour the white chocolate over the dark and then decorate with sprinkles. Even though it is a little past Valentine’s Day, I went with the heart sprinkles and they turned out super cute. Then back into the freezer for a quick 20 minutes. When it was ready, the BOY tried some karate chop move that broke everything up into pieces (and had us both laughing). I usually store my bark in large freezer bags in the freezer. It is ready to serve whenever you want and available as a fun hostess gift. Melt dark chocolate either in the microwave or a double boiler. Linea baking sheet with parchment paper and pour chocolate on. You can smooth it with a spatula to the thickness you desire. Stick in the freezer for 20 minutes. Melt white chocolate. Whisk in cake mix, stirring well until no lumps remain. Let is set for 3 full minutes (or at least until it slightly thickens). Remove baking sheet with chocolate from the freezer and immediately pour white chocolate on top. Sprinkle on sprinkles. Freeze for 20 minutes. Once set, break into chunks. Keep refrigerated. You Have to Try These Bars! A patient gave me this recipe, along with a few sample bars. Since some friends are coming over for girl’s night this weekend, I figured they would be perfect. I have never made them before, but they have all of my favorite flavors, including caramel, so how bad can they be?! First step is to make the dough. Combine the oatmeal, flour, brown sugar, salt, baking soda and softened butter. I did have to microwave my butter shortly in order to soften it. I used a wooden spoon to stir the dough, but needed my hand also as I was having trouble breaking up the butter clumps. My hand worked out well and it ended up covered in dough anyways to press the mixture onto the bottom of the pan. The next step is melting the caramel. I have a fabulous recipe for caramel brownies, and I discovered that unwrapping multiple caramels is boring and time-consuming. So I was able to find these at the super Target and they are fabulous. 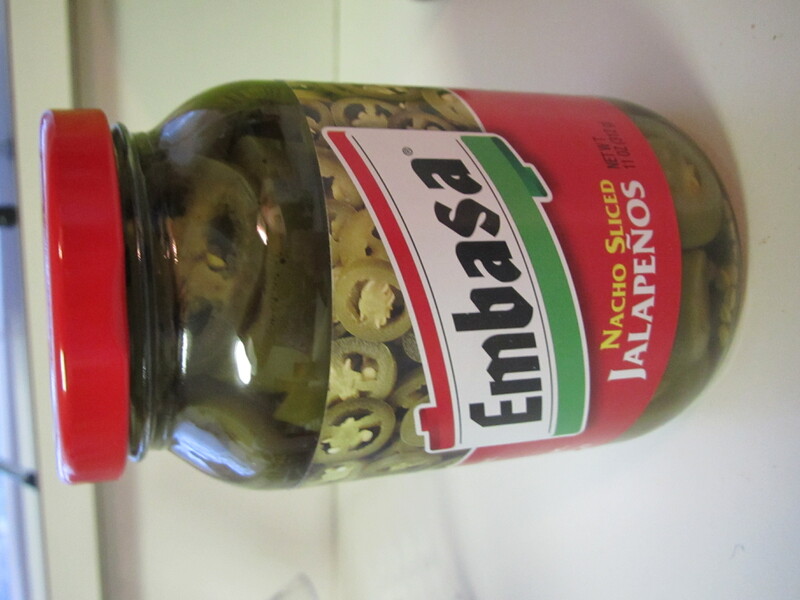 I buy them in bulk now when I can find them, but you can also buy them on Amazon. For this recipe, you melt down the caramels with butter and milk. I have also done this with 1/3 cup of evaporated milk. 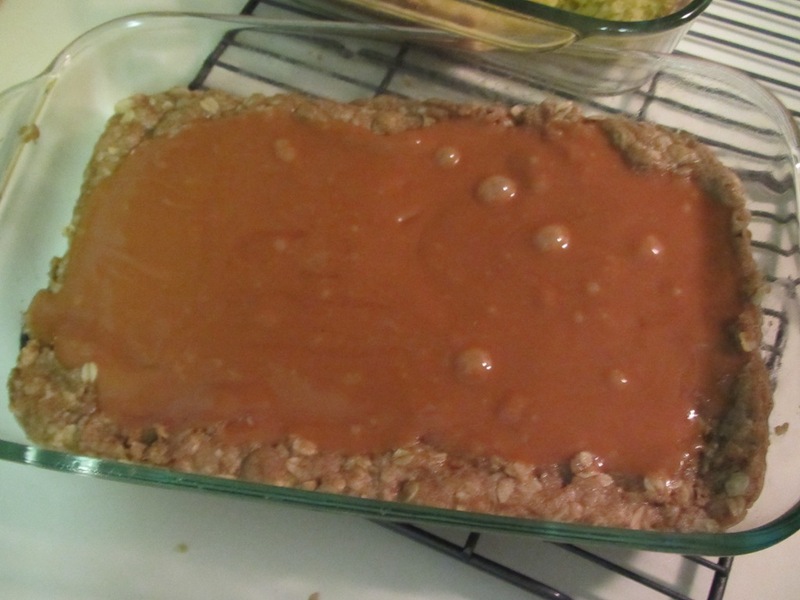 After the oat mixture has baked for about 10 minutes, layer the melted caramel, the chocolate chips, walnuts, and crumbled oat mixture on top. This reminded me of making 7 layer bars but without the coconut. Bake for another 10 minutes and then let cool. This has to be the toughest part…waiting for the bars to cool! The BOY was the first to try the bars and he agreed that the girls would LOVE them this weekend. The only difficulty was cutting the crumbly bars. I stuck them in the fridge to harden them up a bit, which will allow me to cut them and freeze them for Friday night. Preheat oven to 350 degrees. Spray 9×13 pan with nonstick spray. 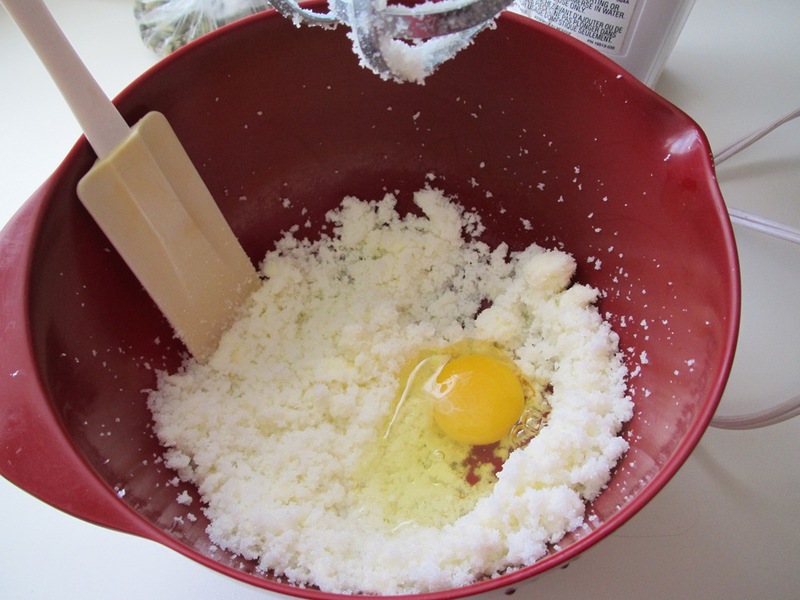 Mix together: 3/4 cups softened butter, 3/4 brown sugar, 1 cup flour, 1 tsp baking soda, 1/2 tsp salt, and 1 cup oatmeal. Put 3/4 of the mixture into pan. Press down so bottom of pan is covered. Bake 8-10 minutes. Cool. Melt 25 Kraft caramels with 3 tsp butter and 3 tsp milk in microwave for ~3 minutes. Stir until smooth. Pour over crust. Top with 1/2 cup very finely chopped walnuts, 3/4 cups chocolate chips and the rest of the first mixture, crumbled over the bars. Bake for 10-12 minutes. Cool completely before cutting into squares. Another rainy Sunday…perfect for soup! This recipe is really easy and takes no time at all. I wrote out the whole recipe below, but you can totally make this your own. 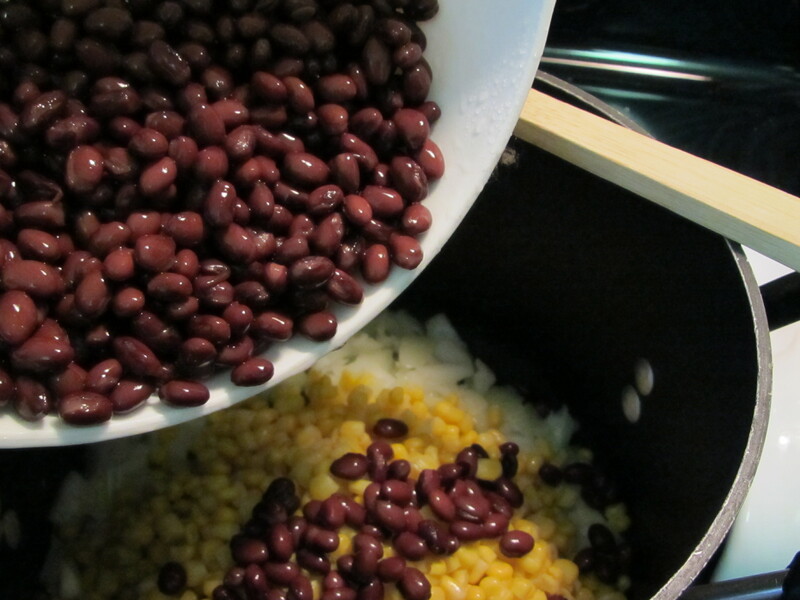 This time around, I didn’t have any white beans and certainly wasn’t heading out of the house, so I doubled the black beans. 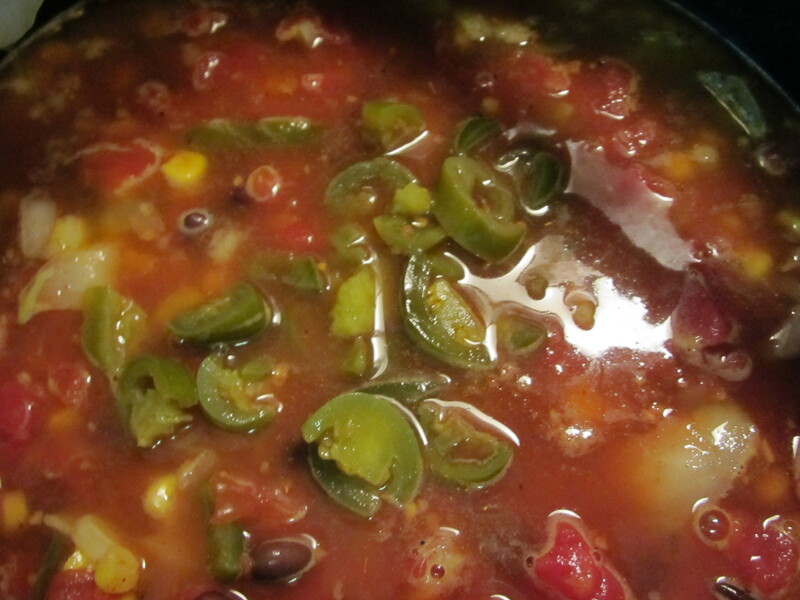 I also had a request for a spicier soup, so I added some jalapeno peppers. 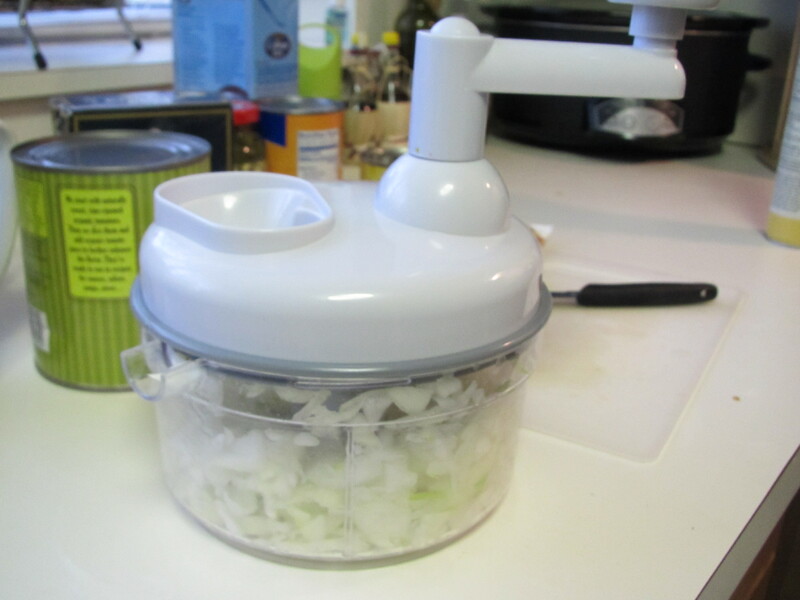 I decided to let my chopper do the work on my onion. Then I sautéed my onion for about 5 minutes until soft and fragrant. I added the other ingredients on top and then the chicken broth (I recommend low sodium). The BOY helped me pick out some stronger peppers at the store. I decided to cut them and add them to the soup. I only used a few, and the soup was much spicier. I am happy I channeled my inner food network star and remembered to taste the soup as I went. 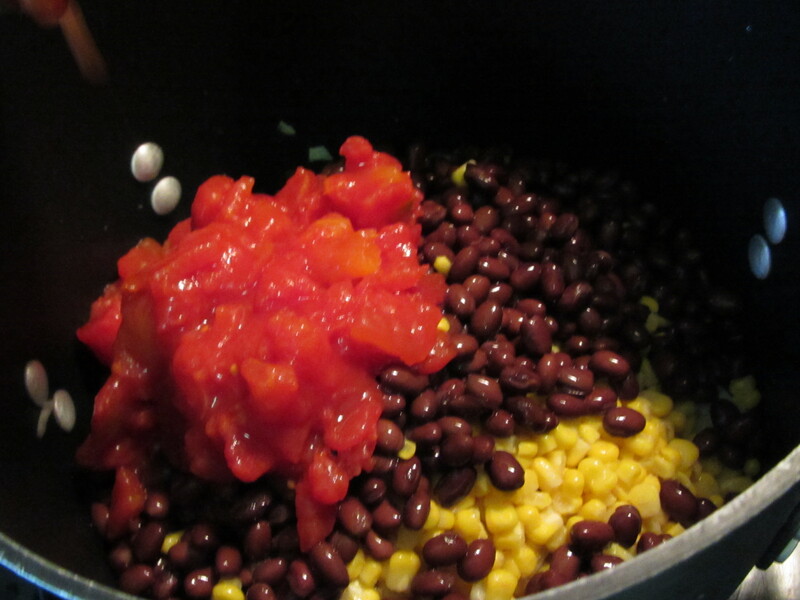 I don’t like refried beans, so I have never added them to the soup. I also shared this recipe with a friend who added turkey meat and made it more of a chili. Delish! Don’t be afraid to get creative! 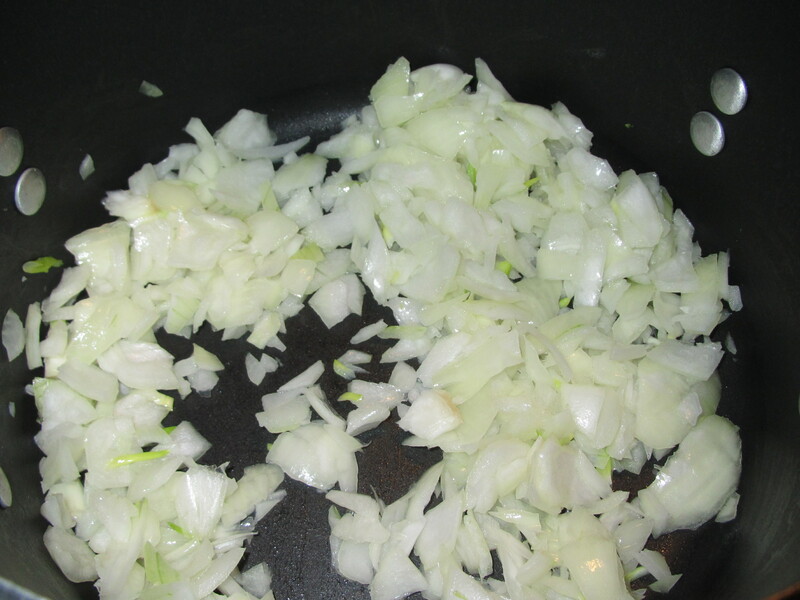 Sauté onion until soft in a large pot sprayed with nonstick cooking spray. 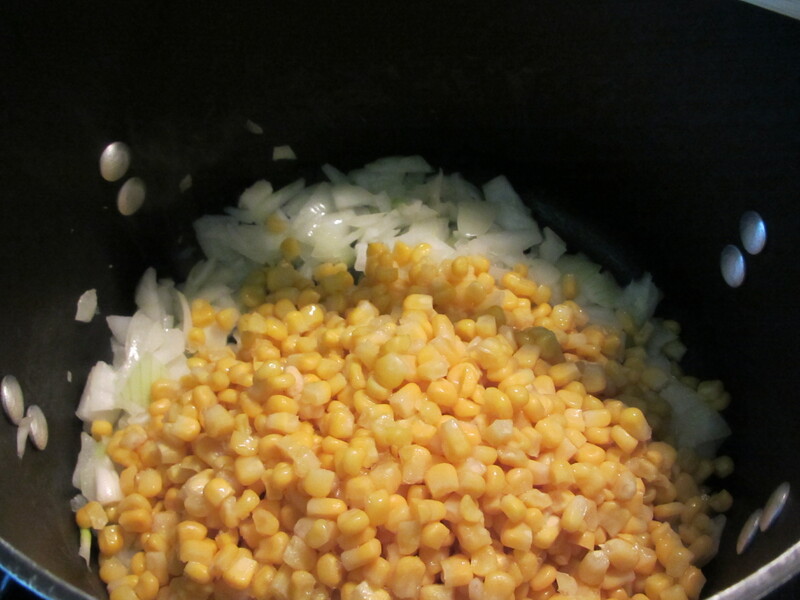 Add the other ingredients to pot and simmer 30 – 40 minutes. Freezes well! I owe ya’ll a recipe, so here it is. Check out more pictures of these BLUEberry Muffins! I wanted to bake some fun and healthy muffins to cheer up a friend. I decided to make these Blueberry Lemon muffins. I have made them before and they turned out really good. I later found out that this is a Jessica Seinfeld recipe from her Deceptively Delicious book. At the risk of boring you with my soapbox, I was shocked to learn this. To my understanding, the premise of the book is to hide wholesome ingredients in common foods to increase your kid’s (and family’s) intake of these healthy foods. What surprised me, however, is that this recipe only uses one ½ cup of squash…divided between ~12 muffins, I question whether this can improve one’s vitamins/minerals consumption in a meaningful way. That being said, I do really enjoy this recipe and other recipes from this book. The extra squash and veggies add moisture to muffins and cookies. I even got the BOY to eat bananas one time without him even realizing it!!! Let’s keep that our little secret though! Just a heads up as you are gathering your ingredients…the lemon extract looks A LOT like vanilla extract. I accidentally used it in my french toast batter one day without realizing it. Luckily, it was just a splash and added an interesting, yet appealing flavor to my breakfast. I didn’t have to time to make fresh squash, but luckily I found some at the Super T. Trader Joe’s carries it seasonally as well. I changed up the original recipe a little bit. I used Turbinado sugar in place of the white sugar. I’m not sure if this is common in baking, but I love the flavor it adds to my quick breads, so I figured why not?! Unfortunately, I didn’t have any fresh blueberries on hand, so I used the frozen ones. I have made muffins with frozen berries before (usually when the fresh ones are out of season) without any problems. I used half white and half whole wheat flour. I know the addition of the wheat flour changes the texture of the muffins, but they still taste great. I loaded my fun heart themed muffin cups and stuck the muffins into the oven. And out came…my BLUE blueberry lemon muffins. I think the use of the frozen berries allowed some extra blue liquid to color my muffins. I called in the BOY for a taste test and although they looked a little odd, they passed the test. I think the sight of a blue muffin will make my friend smile and the taste will definitely brighten any BLUE day! so ya’ll can try them SOON.